This article is about the character. For writer, see Alice Cooper. Alice Cooper was an American rock singer and musician. 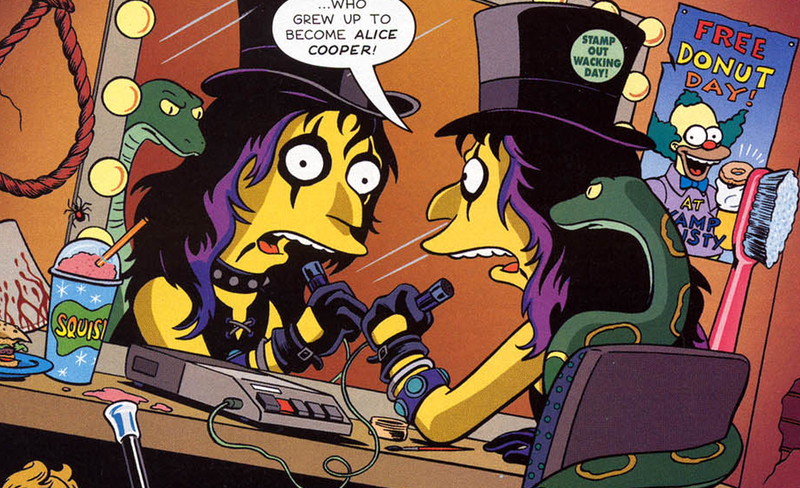 When Homer was in a camp, Alice Cooper was also there. Alice and all the kids at the camp pranked Homer. One of the pranks was to give Homer lots of empty packets of donuts while they all ate the donuts. Many years later at Free Donuts Day, Homer dressed up as Batterface and drove to Shelbyville. He met Alice Cooper here and Homer shoved donuts into Alice Cooper's mouth until he died. Modified on June 27, 2013, at 08:00.